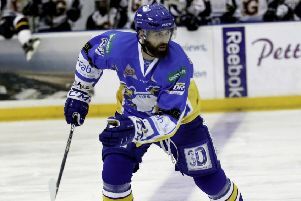 Fife Flyers’ teenage forward Jordan Buesa hit the net for the first time since returning from injury at the weekend. The 18-year-old from Troon scored his first goal since returning from injury in Saturday’s win against Coventry Blaze. That came after a spell on the sidelines with a shoulder injury which temporarily halted his impressive start to life with Flyers. Though he says the following night’s loss against MK Lightning was disappointing, Buesa is confident the team will soon be back on a good run of form. “I thought we played really well on Saturday,” he said, “It was a really good team performance. “Sunday against MK was harder. It was difficult and it was one of those games that just got away from us. “We’re a bit ahead of them in the league table, but there are no easy games in this league. “You just take it one game at a time and you never underestimate the opposition, no matter who you are playing. Despite a five-game run without a win during November, Buesa points out that the team are still in a healthy position in the league. “We’re still up there. I know we lost a few points during that poor run last month but we’re still within striking distance of the top three so we just need to keep on getting points and try and work our way back up again and close the gap. “We made a great start. The boys were really enjoying it and everything was going well for us. “We were flying and then we hit a little bump. You can’t win every game so you just need to battle though it. Having found the net again, Buesa is now looking to improve upon his own form. He said, “I’ve been playing OK I think. I’m still one of the younger guys and I’m still learning. “It’s my first year here, and to be playing during the 80th anniversary season has been pretty special. I’ve been looking back at the club’s history so it’s really an honour to be playing here. Flyers now head into a one game weekend when the welcome Guildford Flames to Fife Ice Arena. “It’s nice to know that we’ve no travelling to do this weekend.” Buesa says, “It’s only one game as well so there’s nothing to hold back for – we need to go out and give everything we’ve got. “During a two game weekend you don’t really think about the following day once you’re on the ice, but leading up to a one game weekend gives you a little extra boost.